If you aren't familiar with ramps, it's probably because they are—depending on where you live—only available for a few weeks each spring. If you can't find them in your region, you might find them online at Earthy Delights or your local Whole Foods as early as late March and as late as April or early June. 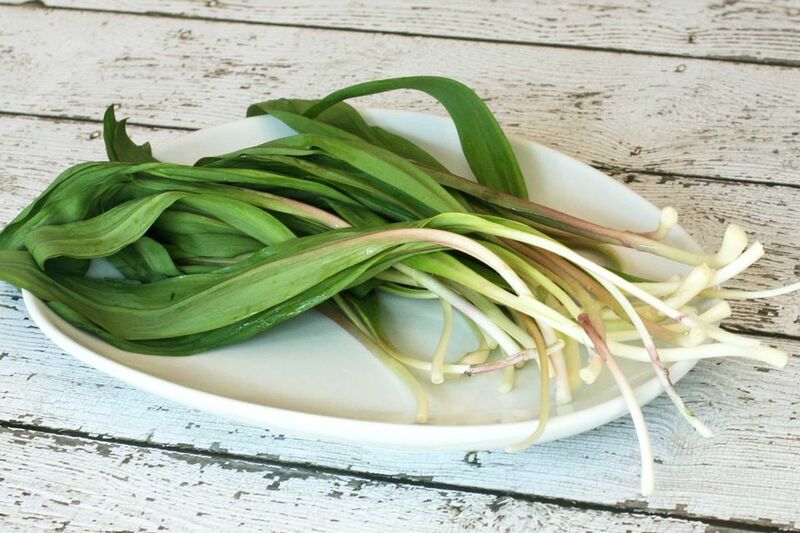 Ramps, considered a spring delicacy to many, are wild onions or wild leeks native to North America. They have long and rather wide, flat green leaves and slender bulbs. The bulbs resemble the bulb of green onions, though the leaves are different. They grow from South Carolina and as far north as Canada, though they are more scarce in Canada. The word "ramps," or wild garlic, was first mentioned in print (English) in the 1500s, and in American print in 1828. Ramps are stronger than green onions and are often eaten raw. They can be used in any dish calling for green onions, leeks, onions, or shallots. This combination of potatoes, eggs, and ramps is a popular preparation. Feel free to omit the eggs or cook them separately and serve them alongside the potatoes. Rinse the ramps thoroughly under cool running water. Remove any large, tough outer leaves. Cut off the root ends and peel off the outer translucent skin. Keeping the white parts separate from the green, slice the ramps thinly. Arrange the bacon strips in a large heavy skillet and place it over medium-low heat. Cook until crisp, frequently turning with tongs. Remove the bacon pieces to paper towels or a brown paper bag to drain. Remove all but 3 tablespoons of drippings from the skillet. Increase the heat to medium and add the white part of the ramps and potatoes to the skillet. Fry until the potatoes are tender, stirring frequently. Add the sliced green ramps tops and cook for 2 minutes longer. Break the eggs over the ramps and potatoes and stir to mix well. Fry for about 2 minutes, or until the eggs have cooked on the bottom. Turn and fry on the other side for 2 to 4 minutes longer, or until eggs are cooked through. Serve the ramps and potatoes hot with toast or freshly baked biscuits and butter. If you don't have ramps, make this recipe with sliced green onions or thinly sliced leeks.